People these days are catching up to Moe Norman, the straight-hitting Canadian savant who might have been the best ball-striker to ever live. There’s even a movie coming out about his life. There’s a golfing school based on his swing, called Natural Golf. Moe Norman — the best golfer you’ve never heard of. Except he isn’t. Whatever that means, it meant something to him and he became a marvelous golfer whose list of accomplishments you can read on many web sites. His five-word mantra about golf was, “Simple game. Nothing to it.” It was all about controlling the clubhead, and “you should always be loose, boneless, muscleless, effortless, because when you are, you can mentally control the clubhead. The backswing: pull it back “to control,” one of his students said. Farther than that and you’ll lose control. He had a five-step setup that was a key element of his swing, which helped him take the body out of the swing, his thinking brain out of the swing, and just use his natural motion controlled by his subconscious mind. Listen and watch him go through the steps in this video. 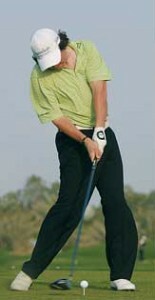 Yes, he’s off balance at the end of his swing, but don’t let that bother you. There are other videos of him swinging that I recommend you look for, because they show a swing of great beauty and effect. The key point for me is that he wants you to let your natural instincts take over. When you’re standing over the ball, reviewing your swing thoughts, worried about the result of the shot, whether you can pull it off, and all the other self-talk you conjure up, none of that has anything to do with what you’re about to do—hit the golf ball. If you can find a way at all to quiet that part of your brain, and just swing, you’ll play better golf and have more fun. You can learn a lot from Count Yogi, the man who made that his life’s message. 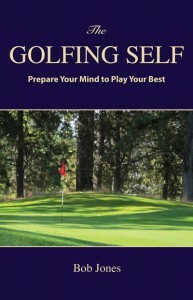 One golf book I read through once every year and then browse through continually is The Golf Swing, by Cary Middlecoff. 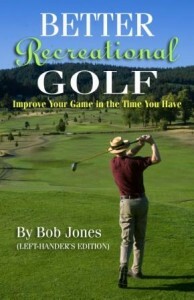 It is a review of the development of the golf swing from Harry Vardon to Palmer, Player, and Nicklaus. 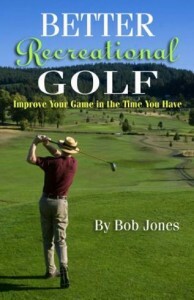 The meat of the book, though, is what he says about developing your own swing, advice contained in the chapter titled, “Your Swing.” He says little about the particulars of the swing, save a few fundamentals, but much about how to practice your swing for maximum return. I’ll summarize his advice for you. – Keep a notebook so you can start the next session where you left off the last one, so you can take your last session’s successes and carry them forward. – Make every shot real. Imagine a spot on your home course and hit this ball to that spot. – Make sure you grip the club consistently. Subtle variations in the grip cause more mis-hit balls than you might realize. – Work on the backswing alone in order to bring the club back to the same spot time after time. – “Program into the swing” that both arms will become straight only a few feet past where the ball was. At impact, the right arm is still bent and the right wrist has not fully released. – Practice the parts so they become automatic. Then put them together into a full swing that allows you, when playing, to forget about mechanics, and concentrate solely on hitting the ball. Well, it really should be an adverb, easily, but you get the point. There’s no need to pound the ball, no need to launch it. Smooth and sweet works every time. I know. I found out for sure yesterday. I’ve been practicing different shot shapes, and one of them is to hit the ball on a low trajectory. This will help the ball get through wind. My ball striking at the range yesterday was pretty inconsistent, to be honest, going through my bag just hitting whitebread shots. When I got to the low shots part of the session, everything changed. Every shot was hit flush, went straighter, and believe it or not, went farther. Why? Because to hit a low shot you don’t want to hit it as hard. Hitting the ball hard adds backspin, making it rise up higher. So to keep the ball down, just don’t hit it as hard. You don’t need to make that much of a turn away from the ball, either, at least, not like you’re cranking up as much as you can. Just get the club back into a hitting area and swing back through the ball. That simple, and oh, so much more effective. I know you’ve all heard it before, not to overswing. But do you pay heed? Remember that the only time clubhead speed counts is when the clubhead meets the ball. It doesn’t matter a bit on the backswing. It doesn’t matter a bit when you start the club down. Here’s the secret. If you don’t rush things, speed will build up by itself and will be all the speed you need at the time you need it. You’ll stay relaxed, tension-free, and get everything you can out of your stroke. The pros hit the ball hard, yes they do. But they’re insanely gifted golfers, highly trained, strong, flexible and so forth. You’re not. I would like to swing at the ball like Bubba Watson does, but I can’t. He’s to be enjoyed, but not to be made my model. If you would take a 5-iron and swing it like you were warming up with a 9-iron, you would probably hit the finest 5-iron you were capable of. That 5-iron is designed to do a job. Don’t get confused over what hits the ball. The 5-iron hits the ball, not you. Just put the club into the position where it can do its job and you’ll be fine. After my latest lesson, the pro asked me to make up a practice plan covering the material we have worked on so far. Here it is. Ten shots with each even-numbered iron, the next session with the odd-numbered irons. Ten shots with the driver, the next session ten shots with the fairway wood. Five pitches to 30, 50, and 70 yards, the next session to 40, 60, and 80 yards. Five shots each: high fade, low fade, high draw, low draw, medium fade, medium draw. The next session, five shots high straight, low straight, uphill lie, downhill lie, ball above feet, ball below feet. Do one pair of sessions with a 7-iron, the next pair with a 5-iron. 4 chips from one spot (one set) to different holes. Putt out. Continue until all 4 balls get up and down, minimum of three sets. 4 chips from 10, 20, and 30 yards (in different sessions) to different holes. Putt out. Continue until 3 balls get up and down, minimum of three sets. Toss 5 balls into greenside rough and get 3 up and down. Repeat. 10 shots from greenside bunker, 5 full swings from [fairway] bunker. 12 3-foot putts in a circle around the hole. 10 putts each to 6, 9, and 12 feet without looking after each putt. Next session from 15, 18, and 21 feet. To learn distance control. 10 lag putts from 30, 40, and 50 feet. 10 8-foot putts in a circle around a hole on a slope. To practice green reading. All this takes about 3 hours. Three times a week.